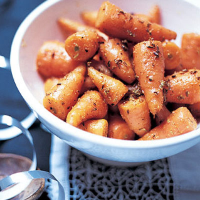 The sweetness of Chantenay carrots and the slight bitterness of fennel seeds and lemon zest complement each other well. We have dry-toasted the fennel seeds to give them a wonderful nutty quality with lots of crunch. Trim the tops of the carrots, scrub well and cook for 10-15 minutes in simmering water until just tender. Using a pestle and mortar, crush the fennel seeds, roughly. Set a large frying pan or wok over a high heat. Add the fennel seeds and cook for 1-2 minutes, stirring frequently, until they become light brown and aromatic. Add the butter and lemon zest to the pan and cook for about 1 minute until melted and frothing. Add the carrots and toss them in the flavoured butter until well coated. Season and serve immediately. This accompaniment is undoubtedly best cooked and eaten fresh. However, it can be prepared in advance and reheated.